Designed for extra grip, even in wet conditions. Top quality aluminium 'T' piece bonded to a 11mm vulcanised rubber base with 2mm tread top and bottom. Ladders that you lean up against walls are useful for accessing hard to reach areas, however they are not always secure on some flooring or in certain conditions. Our ladder stoppers are an excellent accompaniment to ladders, making them safer for the user and preventing the ladder from sliding down a wall. They are designed for extra grip, even in wet conditions making them ideal for indoor or outdoor conditions. The top quality aluminium 'T' piece is bonded to an 11mm vulcanised rubber base with a 2mm tread top and bottom. There are two types available; for use with - ladders up to 400mm/16 inches wide or for use with ladders up to 550mm/22 inches wide. 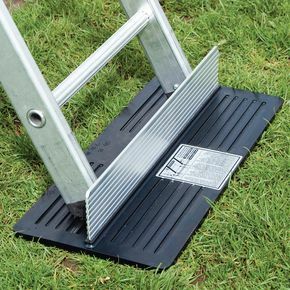 Our ladder stopper is a great addition to help keep you ladder secure while working at height, helping to prevent your ladder from slipping and providing extra grip, even in wet conditions. They come with a 12 month guarantee and FREE UK Delivery.